During the last 2 months I used a lot the words: spa and wellness tourism as a future trend. Why I think so? First of all seeing the well-known map on the World Wide AirTraffic I imagined how many business trips there are, how much stress. And of course the demographical changes that we can easily observe nowadays, without even being an expert; think about the aging population, unhealthy lifestyles, chronic diseases, medical systems with rising costs and too much technology around us. In our Globalized and so fast-moving world, where every second counts, there is no time for relaxing. We are working and trying to prove ourselves, or trying to earn as much money as we can. Wellness tourism (which is not Medical Tourism) as a niche market actually grows. 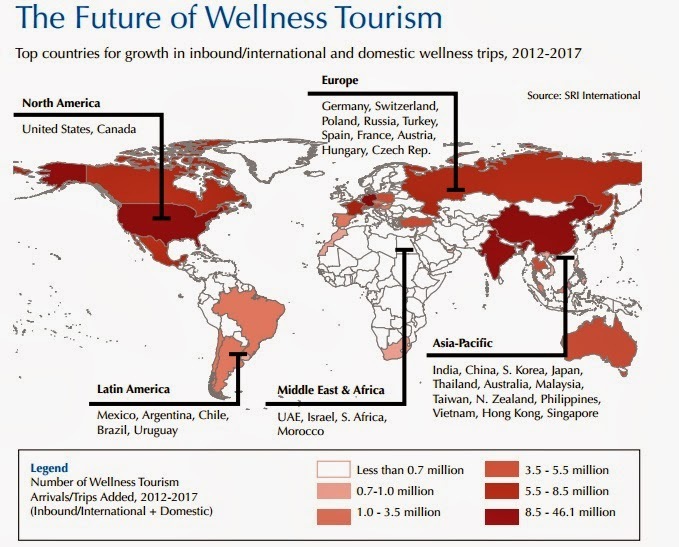 I´ve started navigating and searching for more information about Wellness Tourism, and I have found a very complex report, commissioned by the Global Wellness Institute (GWI), in conjunction with leading research firm SRI International (SRI), and presented at the 2013 Global Wellness Tourism Congress in New Delhi, India. 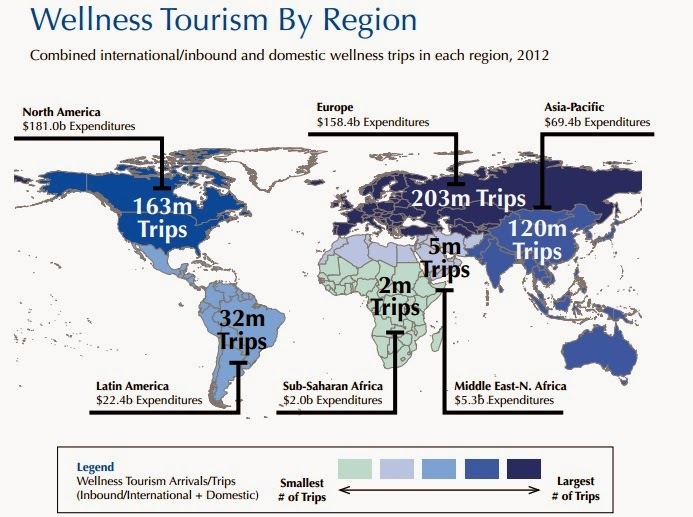 The report´s name is The Global Wellness Tourism Economy 2013, and you can download it from HERE. This report forecasts that over half of the projected growth in wellness tourism trips through 2017 will take place in Asia, Latin America, and the Middle East/North Africa. It also says that Wellness tourism is projected to grow by 9.1% annually through 2017, a growth rate that is nearly 50% higher than that of overall global tourism. Now I see that it is not a "future trend" as I told at the beginning, it is a nowadays trend. Not to forget Spa, which plays a very important role in the Wellness Tourism, representing about 41% of wellness tourism expenditures. For all those who got interested in this Wellness Tourism Trend I strongly recommend reading the report and finding our more useful information about it. You can find it by clicking HERE. A colleague who works with us here at the Global Wellness Institute that puts on the annual Global Wellness Tourism Congress and the Global Spa and Wellness Summit, just sent this to me. We have had a lot of publicity about our Global Wellness Tourism Economy report and very glad to see that you also found it valuable. I am particularly thrilled to see a student like yourself comment on the study. Spreading the word via schools is as important as governments around the world beginning to embrace wellness tourism. One thing that happened at our gathering last year (it took place in New Delhi, India - you can get more information at www.gsws.org) was a realization that there are a lot of students in Tourism who are not aware that the spa and wellness field is growing so fast that there are great career opportunities. So thanks for helping spread the word! I cann´t express how excited I am to receive such a positive feedback from you. Thank you so much for taking your time browsing a little bit through my blog and sharing with us your observation. It inspired me, and hopefully also my fellow students that are going to read it. I also noticed that Wellness Tourism isn´t taken into consideration that much as it should. But from my point of view in several years from now it is going to boom. The basic reasons, apart from the demographical changes, I think will consist in the need of getting away from the very fast moving society and polluted environment. Tourism Industry is beautiful, but health and wellness tourism gives it even more "appeal". Thank you one more time for your time.